A few years ago, when the New Dream staff started tossing around the idea of creating an alternative gift registry, we weren’t all on board. Most of us had an “ick” sort of feeling when it came to registries. Traditional registries can sometimes come across as a bit tacky or even greedy. Plus, New Dream is an organization dedicated to shifting the ways that people consume—so why were we jumping into an industry dominated by big-box stores hawking more stuff? Wouldn’t we be encouraging people to create more waste and clutter? For Flanagin, gift-giving cheapens the holiday vibe. Plus, it’s superfluous. Adults buy what they need when they need it. And if they don’t need it, they’re better off without it. Flanagin and his sister now gift each other purposely useless gifts as an act of Christmas rebellion. 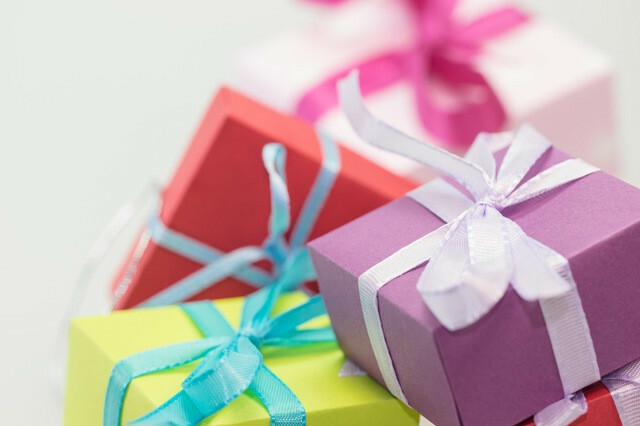 1) People are going to gift you things anyway. My brother just got married this winter, and he and his wife included a line at the bottom of the invitation that said: “No presents, please. Your presence is the best gift.” As I walked out of the reception at the end of the wedding, I noticed a table piled with gifts. And I must confess that I even gave them a gift. It was my brother’s wedding, for goodness sake. I would have felt so strange showing up empty-handed. In my defense, we gave them money to spend on their honeymoon (#MoreFunLessStuff!). But we still disobeyed their instructions. 3) Gifting can create meaningful connections with loved ones. Who says that a wedding or a baby gift needs to be wrapped in a big box or tucked in a small envelope? The $19 billion gift-giving industry does, that’s who. Our aim with SoKind is to shift this way of thinking. We’re not mindlessly jumping into an industry dominated by big-box stores hawking more stuff; in fact, our goal is to disrupt it. Through SoKind, engaged couples can register for national park passes, a homemade recipe book, and help baking the wedding cake—as well as for the stand mixer that you really want. Expectant parents can register for home-cooked meals, babysitting help, college savings contributions, and a stroller. SoKind allows people to ask for gifts that not only reflect their lifestyle and values, but also have the potential to create meaningful interactions. Wouldn’t it be great if Flanagin and his sister—instead of trying to top each other with silly items every year—gave each other meaningful gifts? Tickets to a concert by their favorite musician. Homemade meals on the first Friday of every month. The offer to help clear out the basement. Instead of stressing over their silly tradition that has become a “chore,” they could look forward to a gift exchange that has the possibility of strengthening their relationship and improving their lives.